As the world mourns the death of a great man while celebrating his life we cannot help but revisit the horrific and oppressive past of the country that Mandela changed. South Africa’s most celebrated and lauded citizen was once of its most reviled – at least according to those who propagated and were empowered by apartheid. To a young man seated in the sweltering heat of a Samoan classroom, the study of apartheid and every insensitive legislation forced upon a people in the name of government was enthralling, appalling and altogether enlightening. Thousands of miles away the story and history of South Africa unfolded for me in Samoa under the tutelage of my history teachers and while reading sparse text books, listening to infrequent reports on radio, in magazines and newspapers and sometimes through a grainy television set. The more I listened and the more I read the more active my imagination. I became intrigued with the social issues faced by a people and the activists who ignited a smoldering African fire that eventually grew until the people in power could no longer contain it. At the forefront of a civil rights movement stood the imposing, ever-smiling revolutionary who would become the name and face of the anti-apartheid movement even in confinement – Nelson Mandela. In his youth and early years Mandela was accused of being a communist sympathizer, a condemnation that eventually led to his arrest in 1952 under the Suppression of Communism Act and sentenced to nine months of hard labor, a sentence that was later suspended. He was also banned from attending or speaking to more than one person at a time. It was to be the first of many such bans for Mandela as well as his noted incarcerations throughout the 1950’s and 60’s culminating in his arrest in 1962, his trial and eventually his life sentence in 1964 for being a communist agitator seeking to violently overthrow the government though it is interesting and important to note that Mandela was adamantly against violence and was a staunch advocate for nonviolent resistance. 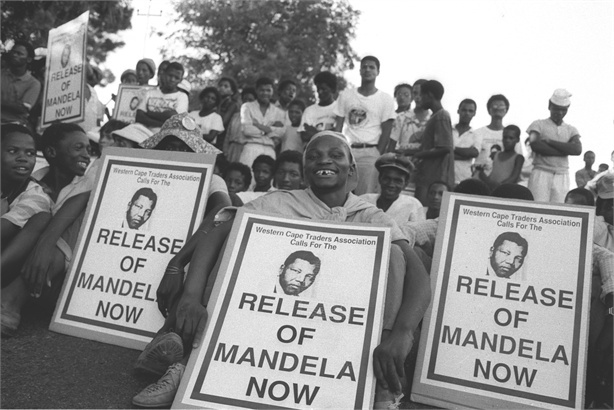 His confinement lasted until February 1990 a period in which Mandela worked to improve the conditions in the prisons and continued to work behind the scenes with activist groups from around the world to end apartheid. Of all the things that Mandela has been credited with perhaps the one that stands out in my memory is the creation of the “Truth and Reconciliation Commission,” organized by Mandela shortly after he was elected President of South Africa and the peaceful overthrow of the apartheid government. Mandela appointed his friend and fellow Nobel Laureate Bishop Desmond Tutu as head of the commission which was tasked with providing apartheid offenders with amnesty while allowing the victims of the apartheid atrocities a forum to air their grievances and then forgive the offenders. Yes, you read that right – forgive! In a society and age where frivolous lawsuits are the norm, the Truth and Reconciliation Commission was formed not to condemn but to forgive the acts of senseless violence and brutality and forge the path towards reconciliation. This to me was by far one of the most inconceivable results of the post-apartheid era but the commission speaks to Mandela’s lifelong insistence and unwavering belief in the struggle for freedom and democracy without ever employing violent tactics to achieve that goal. That to me is the measure of the man’s character. My view of apartheid was myopic compared to the expansive view surveyed by Mandela from the confinement of a prison cell. I assume that he had considered the response to the tyranny of his captors and the condescension of his apartheid government and the potential impacts of his words and actions. The government advocated violence, corruption, segregation and subjugation while Mandela upheld peace, integration, transparency and freedom. Very few people have influenced my view of the world in the way that Nelson Mandela has influenced me – not for his political leanings but for the way that he rallied for the rights of all human beings to be treated as equals. Mandela’s desire to create a world that is better than the world he witnessed as a child and youth and his advocacy for human rights invites us; implores us to look into our own souls and ask the question that others would ask of us – what are we made of? I admire the strength and character of people like Nelson Mandela. As a human he was prone to human flaws. But I believe that Mandela’s life is evidence to us of what we can become when we embrace our flaws, vow to be a better person and empower those around us to do the same.